20 Rustic Easter Decorations Bringing a Farmhouse Appeal to Your Home! Home » EASTER DECORATIONS » 20 Rustic Easter Decorations Bringing a Farmhouse Appeal to Your Home! Easter is right around the corner, and it seems time to be immersing the house with festive-themed decorations that signify the day. Loads of bunnies, carrots, lavishly adorned eggs and all are totally going to be in. How about getting it all done with a touch of rustic? Here are 20 rustic Easter decorations bringing a farmhouse appeal to your home. Can Easter be ever accomplished without bunnies going for the decorations? This one is quite a rustic version to the same, putting together a bunny with nothing but wood slices. Different-sized tree branches would work just perfect to get it done. You work up 2 discs for the ears, 2 for the feet, dedicating one each for the body and head. 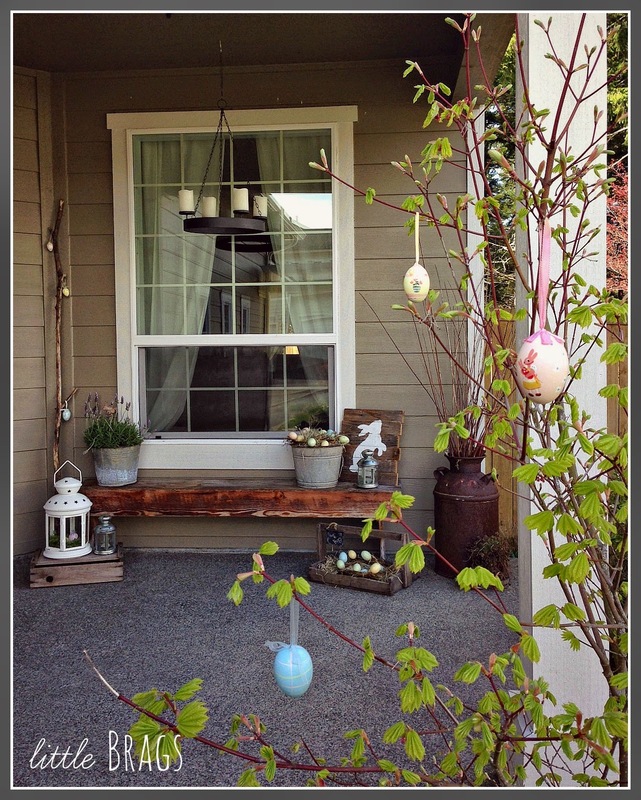 That wood slat sign with a cute bunny silhouette in white is the most special part about this Easter porch decor. A galvanized bucket and a wooden tray accompany the sign, each of which holds a nest with lots of pastel-hued Easter eggs placed on random spots. One of the most mess-free and hassle-free decor projects! A galvanized tiered tray with its 3 sections opens a whole world of possibilities to customize it for the occasion, and the touches of spring brought to the tray make it an applause-worthy centerpiece. Lots of eggs, birds, nests, bunnies and bright tulips are arranged in super creative fashions to fill the 3 tiers, along with a cute chalkboard sign saying “spring”. Subtle and beautiful are all these tablescape signifies, while going for decor elements that go for whites, pleasant hues of green and some rustic touches. A 3 dimensional bunny rests atop of a bunch of books, while a nest on the side holds white glossy Easter eggs. Behind the decorations, you have got a large chalkboard with a festive message. We bet the guests wouldn’t be able to take their eyes off of this stunning Easter floral arrangement. Not only has it got loads of pretty delicate flowers spread their charm around the space, but the arrangement also displays Easter eggs in style. A rusty orange colored basket makes the natural speckled foam eggs look even cuter. Craft a miniature Easter nest all by yourself combining an easy-to-make bunch of eggs with some chocolatey treats. The eggs are crafted with newsprint and tissue tape, further assembling them into the nest in an old English muffin mold tray. What accompanies the eggs is lots of paper grass, some chocolate eggs and choco bunnies. What an Easter-worthy take on homemade wreaths! Instead of hanging the wreath on the front door, frame it this season to make a rustic table top decoration. A chicken wire sheet forms the backdrop for the speckled egg wreath tied with a ribbon bow on top, while a wooden frame with a distressed paint job takes the rusticness to next levels. A piece of craft that blends functionality with decor, this rustic Easter cross is constructed entirely out of reclaimed objects. The cross combines an antique table leg, soome pallet wood, vintage crib spindles, and a vintage cake pan together. The cake pan doubles up as the planter for keeping the Easter cross standing in place. A luxurious-looking spring centerpiece with a vintage element to itself, this one doesn’t call for more than 10-minutes to assemble. It features an ironstone pitcher, lots of cotton stems from Hobby Lobby doubling up as flowers in a vase, a rustic basket, an insanely adorable bunny and colorful speckled eggs in subtle pastel hues. Candle holders can have so much more to themselves than simply holding candles! And this Easter tablescape featuring lots of handmade candle holders showcases that just right. While some sticks form the base for glowing candles, the others hold miniature nests with green moss and speckled eggs. The glass jars form greenscapes with even more elegance. 20 DIY Easter Centerpieces Ready to Cast a Heartwarming Spell!